The December theme for my ATC swap group was "Peace." Usually I make identical cards for everyone in the group, but this time decided to make each one a little different. I painted the background with acrylic paint and used materials such as rick rack, washers, paper doilies, adhesive gems, and scraps of paper. The images are from handmade gift tags I bought last year to benefit a children's hospital. The "peace on earth" is cut out from holiday greeting cards. It's hard to see, but the background on this one is a piece of a dryer sheet. You can see the painted blue background right through it, but it gives the ATC a little bit more texture. This ATC is for a "Holiday" themed swap. It has a metal Made with Love charm glued to the front. 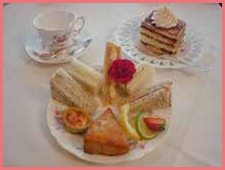 Last night I attended a Holiday High Tea with some friends at Lisa's Tea Treasures and had the most scrumptious food. Sparkling cider, tiny sandwiches, savories, fresh salad, Christmas tea, and scones. Everything was presented beautifully, and the tea room was so cozy lit with candles. A big thank you to Rachel at One Pretty Thing for featuring my knit fingerless gloves pattern, and another thank you to Katharine at Woolly Wotnots for posting a link to my slipper pattern. I love seeing all the different ATCs you made for December's PEACE theme. Wow, they are all so beautiful. You are a very talented lady. 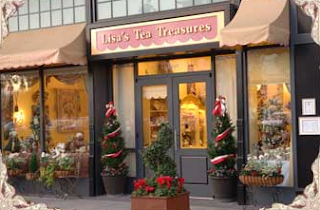 Sound like a fun time at Lisa's Tea House. It is a sweet place and the food so pretty and yummy. Yipee for our upcoming rain. Sounds perfect to me. Have a festive and fun day. I'm working on your glove pattern....sooo easy! Love your cards! They are gorgeous! Dryer sheet, how creative:) Sounds like a fun time with your friends at the tea house! Have a blessed day dear friend! Your cards are so pretty Stacy! And how fun to go to a Christmas tea -- the treats look yummy! I lurve your tea shop, oh wow what a lovely Christmas treat with friends. It looks so magical and your tea looks so sweet.